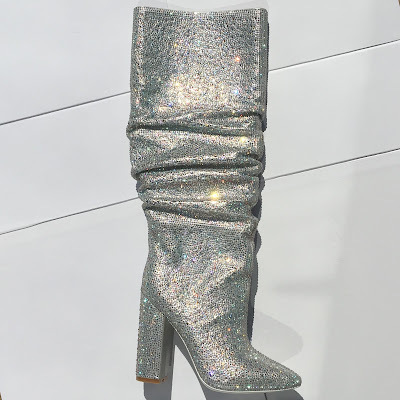 Remember that time Anthony Vacarello stopped the world by sending a pair of mesmerizing silver, jeweled slouch boots down the YSL Fall 17 runway? Did you also seethe with envy swoon when Rihanna wore those exact boots less than a week later? OK, us, too. While we had zero hopes of securing the $10,000 (yes, you read that right) phenoms of footwear, we have since been wondering who would be first to make a similar style available to the masses. (Because in addition to that price tag, there's also a crazy waiting list.) Well, it looks like British brand, Kandee, is among the leaders of that pack with its aptly named "Bad Girl" boot. Though the $550 version doesn't have the structural cone heel (because, uh, hello trademarks), it does have the pointed toe, slouch silhouette and dazzling allover crystals. (That's what matters most, right?) If you're chasing this trend, you'll have to pre-order a pair HERE. They'll take 3-6 weeks to ship— according to Kandee, they're handmade to order.